Tuesday, February 14, the “Powder of Love” takes flight with one-of-a-kind chairlift speed dating. Up for a snow match? A little personal warmth on a chilly mountain? The chance to cross skis with a potential romantic partner? 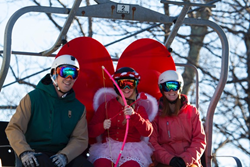 Then come to Wintergreen Resort in the Blue Ridge Mountains on Valentine’s Day, Tuesday, February 14, when the “Powder of Love” takes flight with one-of-a-kind chairlift speed dating. Between 1 and 4 p.m. on Valentine’s Day, a special speed-dating lift line on the Blue Ridge Express will be open to skiers and snowboarders. Parka-clad participants will be paired and expressed to the top of the mountain, armed with a card of conversation starters. If the two skiers don’t fit hand-in-mitten, they simply part ways at the top of the mountain and try to find a downhill date again after the next run. After that, any future binding and un-binding is up to them. Already have a sweetheart? Check out Wintergreen’s midweek Ski & Ride More Package. The perfect escape for Valentine’s Day, the package includes double-occupancy lodging and lift tickets from 9 am on the day of arrival through 5 pm the day of departure and is valid from Sunday through Thursday nights, excluding February 19-20, 2017. Rates start as low as $89 per person. Après ski time options at Wintergreen can include a relaxing soak in an outdoor hot tub, dinner for two at one of the resort’s restaurants, or a cozy fireside snuggle. Following an active day on the slopes, consider a couples’ massage at the full-service Wintergreen Spa, which features a full menu of treatments and services. Wintergreen Resort accommodations include 230 villa-style condominiums and rental homes, from studio suites to nine-bedroom homes, each offering a fully equipped kitchen, and comfortable living area, and most come with fireplaces and a balcony or deck. For more information call 888-329-5828 or visit http://www.wintergreenresort.com. About Wintergreen Resort: Wintergreen Resort is an 11,000-acre, four-season resort located in the Blue Ridge Mountains southwest of Charlottesville, Va. This beautiful hideaway is the ultimate vacation and conference spot, nearly 230 condominium-style accommodations; 45 holes of championship golf; snow skiing, snowboarding and snow tubing; an award-winning tennis program; a full-service, destination spa; 40,000 square feet of meeting and event space; and savory dining options. The resort is located adjacent to the Blue Ridge Parkway in beautiful central Virginia near Charlottesville, just 90 minutes from Richmond, Va., three hours from Washington, D.C. and Raleigh, N.C., five and a half hours from Philadelphia, and eight hours from Atlanta. For more information, guests can call (434) 325-2200 or visit the resort’s web site at http://www.wintergreenresort.com.